Pros: It’s not often you can say that an office chair put in a sterling performance, but here it almost steals the whole show. Cons: Still very much a work in progress, and there is an imbalance that will need addressing. It may not actually star, or even be endorsed by, Jake Gyllenhaal, but Verity William’s debut show about loneliness has the castors to roll on and on. Roddy Frame’s ‘Loneliness and being alone don’t always mean the same’ has always been a song line that plays in my head regularly. But it wasn’t a line I expected to come to mind whilst watching Jake, the debut show from Verity Williams. Because what grabs your attention in all the pre-show literature is the idea that the show features Hollywood actor Jake Gyllenhaal, except for tonight’s performance the role of Jake is played by an office chair. After reading that, it’s very easy to miss that the show is also about loneliness. 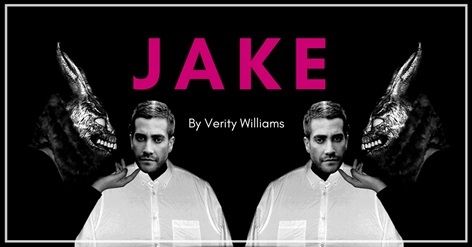 So in the intimate confines of the Drayton Arms Theatre, Williams welcomes us to the local branch of the London Loneliness Club, AKA The Jake Gyllenhaal Superfan Club, comprising the loved-up couple of Verity and Jake. Except, as noted, Jake is a handsomely dressed office chair. The opening is all a little surreal. It’s certainly eye catching as Verity, half lap dancer, half rabbit from Donnie Darko, dances with Jake. She literally throws herself at him at times, gliding not so graciously across the stage in the arms of the seat. Because they want to show all the lonely hearts present that love is possible, that you don’t have to be alone. And to drum home the point the pair then perform a number of classic movie love scenes. It’s an incredibly well choreographed opening, with actor and chair in perfect sync. It’s full of energy, beautiful physical comedy and not a little bravery as she risks life and limb in chair-Jake’s arms. Most importantly it is not the whole show. It’s timed perfectly, because just when I start to think that this could get monotonous, the show moves on. Even the funniest ideas have a time limit and Williams seems to have grasped this. Suddenly the pace and mood change. Williams is left high and dry by chair-Jake and so presents the next Loneliness Club meeting solo, performing the same opening dance routine but without chair-Jake to partner her. She puts on her brave face and pretends everything is just fine. But it isn’t. And here we finally get to the nub of the show. Even in front of an audience, even surrounded by people, not alone but still full of loneliness. She becomes confessional, admitting her own demons, her own fears. Fears that many in the audience no doubt share and are too afraid to speak out loud. Jake is Verity Williams’ debut as a solo artist and, as she openly admits, very much a work in progress. There are moments where the show founders, and the question and answer section in particular needs major rethinking. It kills the flow that she has worked so hard to create, leaving the audience waiting. It has a purpose but it could be woven in differently. The continuity also needs to be addressed. The concept of this being a Lonely hearts meeting group is wonderful, except it’s there one minute, gone the next. Grow it, use it, confess to the club members, not the audience. If this show is to grow it needs a solid backbone and maybe that could be it. But for all its flaws, the show demonstrates that Verity Williams is a versatile performer and writer. Also, that Jake is a show that has legs, (or should that be castors?) It has enough humour and depth to warrant being developed further. I do hope it is, and then I’ll look forward to my invitation to see what it has become.